There are hundreds (or maybe even thousands) of baseball drills out there, but the best drills focus on the right movements and can be practiced from an early age all the way to the high school or even professional level. The beauty of The Hitting Vault is that Coach Lisle shares over 70 hitting drills and videos that he currently uses when working with his college and professional hitters. 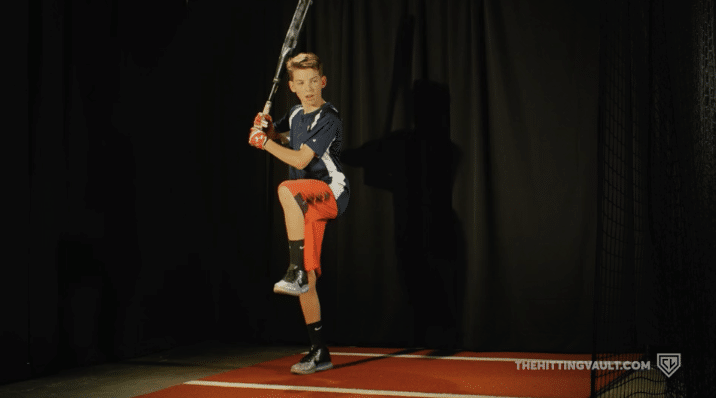 Check out these 4 hitting drills for youth players that we see making a huge difference for current members of The Hitting Vault. Timing is one of the most important aspects of hitting. Controlling your stride and being able to work your hands and legs in rhythm will set the foundation for a strong swing that is on time. We love this drill because it can be done anywhere and at any time. All you need is a bat. You can begin this drill with the bat on your shoulder or in your stance. Stand on your back leg (for lefties, that is your left; and for righties, your right leg) and balance yourself. From this position, you want to fall into what we call Launch Position, this is the position you will be in right before you explode to the point of contact. This is launch position. As you can see, the hitter’s stride is about half of his height, he is loaded, balanced, and ready to go. Now the importance of this drill comes in the fall; notice the hitters hands. His hands are loaded towards the catcher’s feet and his front arm is not locked and extended. As you fall into launch position, you want to move your hands into launch position as well. The controlled fall drill is really an advanced stride drill, that you can do in the on-deck circle, your bedroom, or in the cages to help develop timing and rhythm between your stride and your load. One-handed drills can be monotonous, however, in order to maintain your swing throughout your career, it is important to have these drilled into your routine. As a hitter, it’s all about feel. 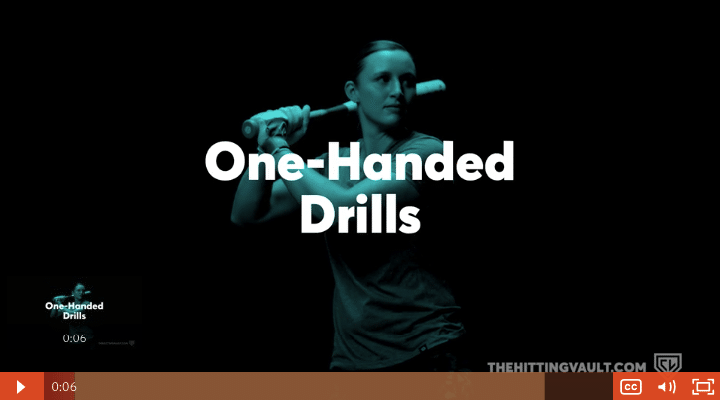 When you start to feel your top hand getting weak, or your bottom hand pulling your shoulder off the baseball, a great place to start is with one-handed drills. Check out our free preview of how Coach Lisle uses one-handed drills with his hitters in The Hitting Vault. Picking the right bat for these drills is essential, mimicking the length of the bat that you use in game but changing the weight is generally what we recommend. For example, if you swing a 33-inch bat in the game, grab a 31 inch, and 20-ounce bat for the one-handed drills, in order to try to replicate the size of the sweet spot. For the bottom hand portion of this drill, you want to begin in your normal stance, but leave only your bottom hand on the bat. The stride you take in this drill should not go past the tee, you want to stride to the tee. Note how our hitter still loads his hands as if he had two hands on the bat. The knob is still pointed towards the catcher’s feet. Instead of dragging the bat through the zone, he uses his hips and shoulders to drive his hands through the point of contact and finishes his swing. He is loading into his back hip and driving with his lower half and shoulders to drive and lift the baseball. Like the bottom hand portion, start in your stance, and begin your load towards the catchers’ feet, and load against your back hip and leg. Then drive your hand through the baseball and finish the swing extended. Isolating both hands in this drill will help you identify where you could be going wrong in your batting practice. This is a great drill that you can start having your younger hitters do to build power and strength. 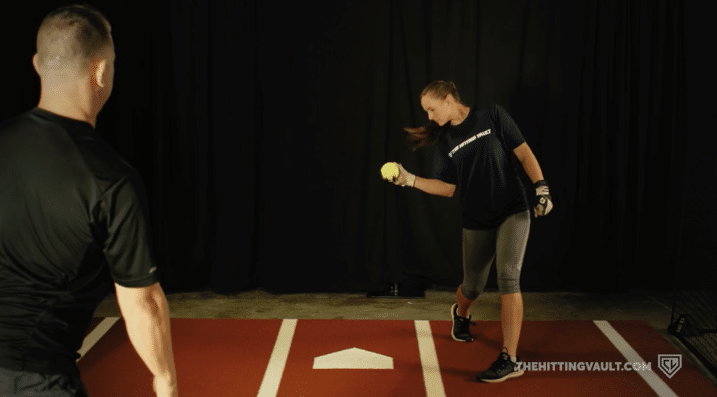 The medicine ball toss drill helps a young player develop strength in his or her core and starts to develop a feel for the explosive core movements that it takes to hit for power. You can start doing this drill with a six-pound medicine ball and as you get older and stronger, you can pick up a heavier ball. If you don’t have a medicine ball, click here to pick one up on Amazon. Not only does this drill help with building strength, but it also helps with developing muscle memory for the correct movements in the lower half of the swing. You want to begin this drill with both hands underneath the ball, standing at shoulder width apart. From here, you want to stride and swing the ball back to your back hip, emulating similar movements to swinging a bat. When you stride, you want to load your hands back towards the catcher’s feet. Here, Coach Lisle is loaded and ready to use his hips and shoulders to throw the medicine ball as if he was ready to explode through the baseball. Note how he finishes, he releases the ball out in front and finishes the swing like motion. For this drill, and any other for that matter, you want to make sure you are comfortable. This is a drill that can help develop power but it is important that you do it right. For other strength training drills from The Hitting Vault be sure to check out SwingFit, our guided 8-week strength building program specifically for baseball and softball hitters. At The Hitting Vault, we combat this common problem with a simple yet effective drill called the track and catch drill. Hitters should be in the batter’s box, loading and striding and attacking the ball like it was a real pitch. One important coaching point here is do not reach for the baseball, let it travel and emphasize catching the ball where you would normally make contact. 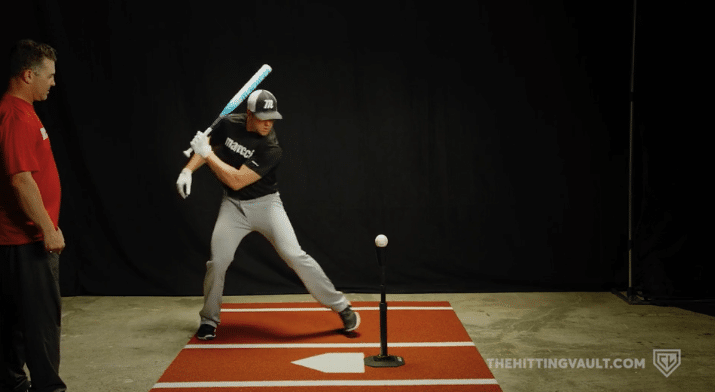 Let’s look at some images taken from this drill inside The Hitting Vault. Coach Alexa Peterson is in her stance, ready to take her stride and take a swing. From here, she will load and attack the ball that will be flipped to her by Coach Lisle. Note how she has a good bat path, if she was hitting a ball she would have her elbow in and hands extended through the ball. Her lower half also is in perfect position, she is using her legs and hips in order to generate power. 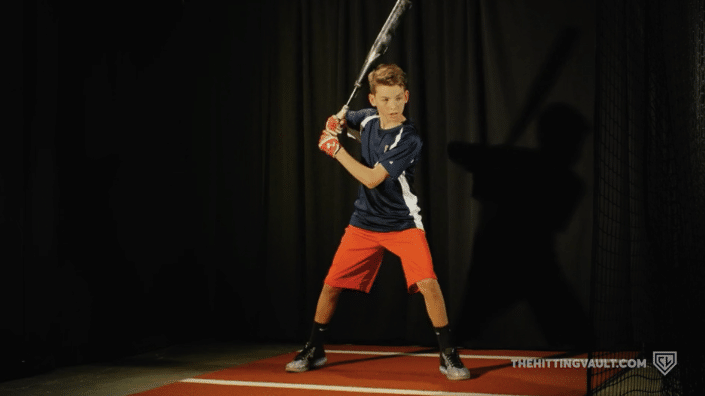 These drills are a few of our favorite hitting drills for youth baseball players. 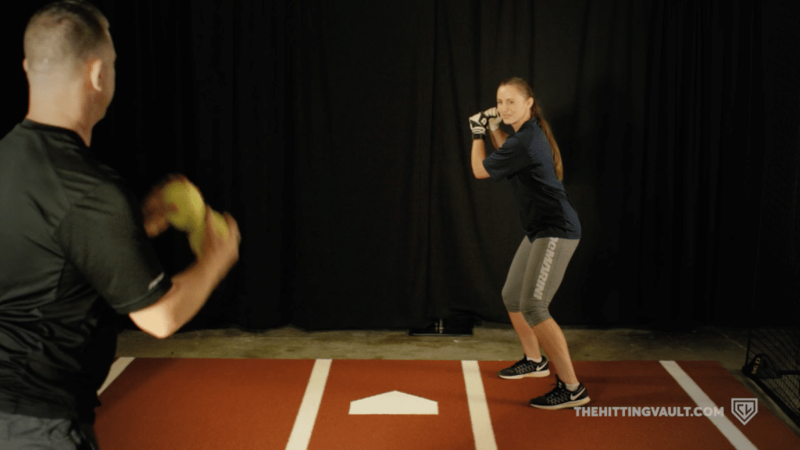 Each of these four drills are available to current members of The Hitting Vault, where we are on a mission to helping hitters of all ages with the resources they need to unlock their power at the plate. Become a member of The Hitting Vault for over 70 more hitting drills similar to these, all of which are battle-tested by Coach Lisle with his college and professional hitters.